And the orange ones. I love the orange ones. 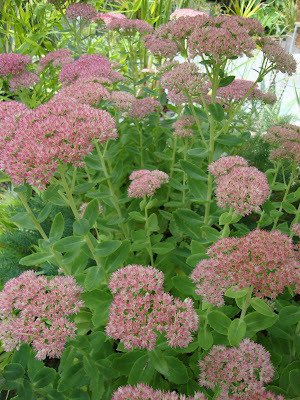 Nothing says September like the Sedum ‘Autumn Joy’ blooming. I hate a love hate relationship with these plants. The bees love them and I can tolerate them, so for now they stay. My Acanthus has finally had babies. I keep reading about how they tend to spread, but mine never had. Finally the 3rd year in (I think…I loose track of time) it has babies and the babies are blooming about a month after the mama plant. Maybe next year I’ll get brave and divide them! 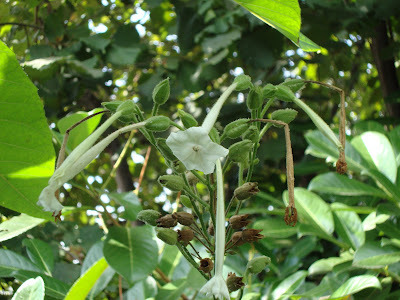 The Nicotiana keeps pushing out more flowers, although it looks about done. Love how bright and cheerful these Sedum ground cover blossoms are. My mother gifted me two Sedum 'Chocolate' and although they weren’t terribly excited about the move to my garden they are starting to bloom. Maybe they are going to make it after all. 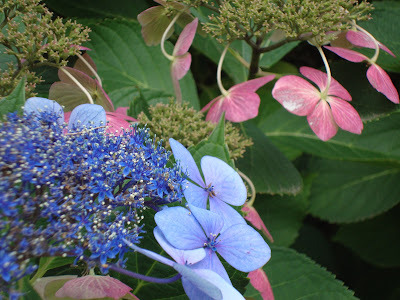 The split personality Hydrangea is, for the most part, pink now. Although there are still a few late blue bloomers to confuse things. 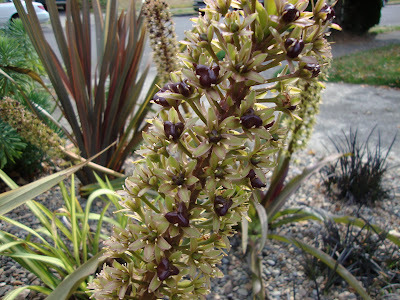 The Eucomis Oakhurst are starting to fade and get this lovely purple/black center to the blooms. This plant is just simply wonderful and you really should buy a few. 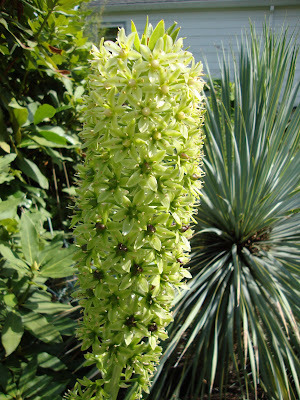 The Eucomis Pole-Evansii is at the height of its show right now. I pray that this one multiplies like the Oakhurst. It’s a beauty! Happy Bloomday to you all. Things are really starting to wind down and I have to admit that fall is (almost) here...but visit May Dreams Gardens to see what else is blooming around the world on this September 15th. Those Canna lilies are show stoppers. Like the rest of your blooms also. 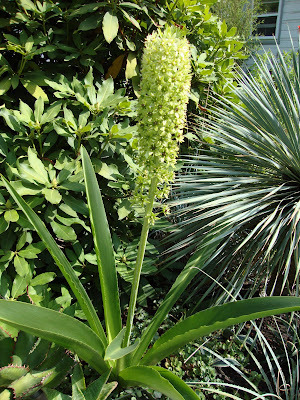 Ooh, I love that Eucomis Pole-Evansii drumstick of a flower, and the Eucomis Oakhurst too. I've never seen these in Austin. I keep meaning to try an Acanthus mollis. Those Eucomis are great. Not messing around, are they? 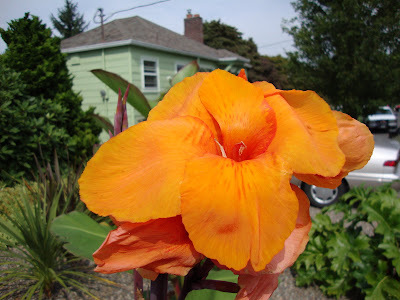 I think my local hummingbird taught me to appreciate the canna flowers. The garden is looking oh so fabulous ! 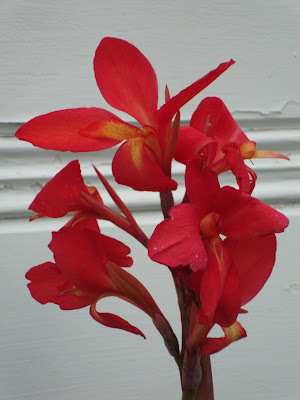 I'm warming up to the canna flowers too, the little tiny ones that show up on C. musifolia. 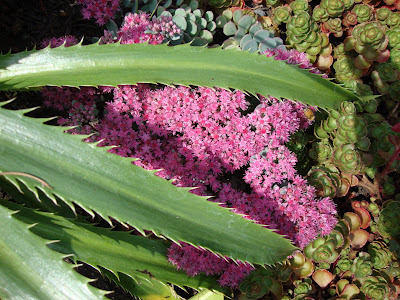 I have that same love/hate thing with Sedum Autumn Joy. It's one of the few thriving things in the area it's in, so it seems wrong to take it out, but some day I'll have the courage. I've found acanthus are pretty easy to divide, even if you're not trying to. I've tried to dig them out entirely but just divided them instead. They do take a full year to recover and get big again, at least in my yard. I am going to follow your advice and get some Eucomis, they've won me over. I can't believe I never noticed them before. Always can count on you for something new and unusual to try. I will be looking for Eucomis at HPSO on Saturday. I always leave the Acanthus stalks on the plant as long as possible. As a result, they find the places they want to be...birds?...wind?...I don't know, but the ones that plant themselves do best, though the transplants and divisions do well too. Mary Delle, thanks for stopping by! Pam, the acanthus is pretty thirsty...and wilts in the direct sun. 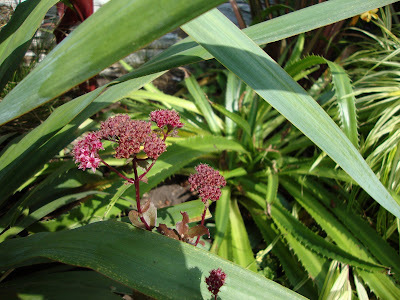 But the Eucomis is a trooper! 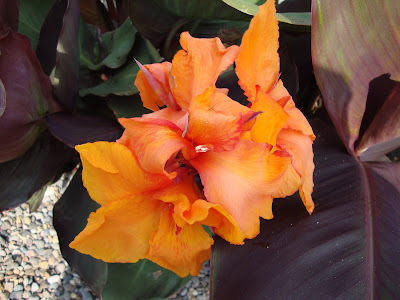 ryan, you know I have never seen a hummingbird anywhere near my canna flowers! What's up with that!? Megan, no flowers on my C. musifolia yet, maybe for next bloomday. I've read that is the case with the Acanthus, you plant it somewhere and it will be there forever. Even if you try to move it. Thank god I like it. ricki, yea! Glad to push you over the edge. You won't regret it. They even came back after last winter so definitely hardy! 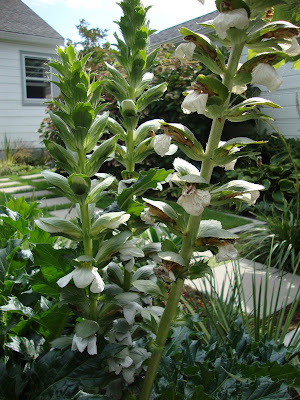 Interesting about the Acanthus...I have never noticed them spreading around like you describe and I leave the stalks on too. That's what I've heard about the acanthus, Loree. MSS at Zanthan Gardens, also in Austin, has grown them. I think they disappear in the summer and come back in the cooler season. No danger of invasiveness in our climate either. I really like the acanthus. They're so architectural.